I ran into you yesterday—well, your name, anyway—in an unexpected, but in retrospect not surprising, place. Look carefully; on the next to last line at the very bottom. The world is full of connections if we but look for them. I have to thank my buddy David Stinson for including my name in his bio, as well as the sharp-sighted Allyn for sharing this. 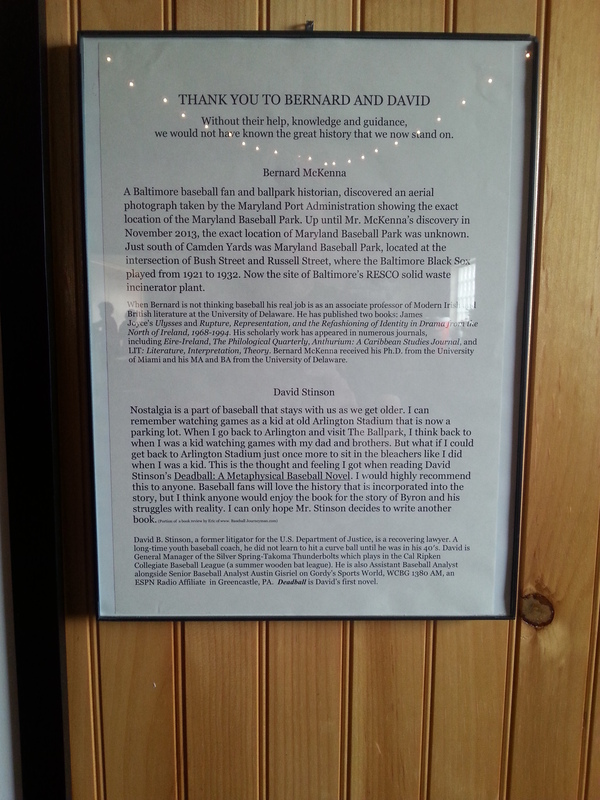 This entry was posted in Baseball in General, Life is Interesting and tagged David B. Stinson, Deadball: A Metaphysical Baseball Novel, old Oriole Park, Peabody Heights Brewing. Bookmark the permalink. Yeah, I guess as long as the brewery lasts. Hey Austin. You me and Gordy 4 -ever! Don’t worry. The brewery is doing quite well. It’s not going anywhere! Nice blog on Mom and me at Old Oriole Park. Just want to let you know I’m commenting on my Smart Phone!